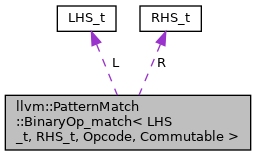 Definition at line 616 of file PatternMatch.h. Definition at line 622 of file PatternMatch.h. Definition at line 624 of file PatternMatch.h. References I, and llvm::PatternMatch::AnyBinaryOp_match< LHS_t, RHS_t, Commutable >::match(). Referenced by llvm::PatternMatch::CastClass_match< Op_t, Opcode >::match(). Definition at line 617 of file PatternMatch.h. Definition at line 618 of file PatternMatch.h.